I confess that I’m pretty happy with myself today. I anticipated a rough work day and I did have a lot to do- but I did not let it kick my but! It’s easy in my work to look at days that did not quite go as I planned and get down on myself. I’m all for self evaluation but seriously it’s hard on even the best planned days to stay on cue because so much of what I do is crisis driven and out of my control. So when I have a day like today I may be tired when it’s over but still it’s nice to feel good about the outcome. Klaus is making such progress in his recovery and while his legs were for the most part paralyzed between three and four weeks ago, he is now able to rise and stand on his own for three or four minutes at a time. He is trying to walk but it starts out as more of a crawl. and as he gets himself up in his excitement and momentum he will topple over at times. I confess that I am excited to see him trying so hard and having some success, but it breaks my heart when he stumbles. I know he has to do this if he is going to walk anything close to how he did before his injuries but I confess it is sometimes hard to watch. He works so hard. By the end of the day his little body is really taxed.It all reminds me of when the kids were small. As a parent you hate to see them tumble and get hurt, but you know you have to let them learn and that involves falling down too. I confess this past week has pretty much been a bust as far as writing. Not getting near enough done. I further confess that the past month I have blown off submissions. I’m not happy about either of these things. I confess that I am well aware that the process of writing and achieving publication is work and requires a discipline and I can honestly say I’ve not exhibited much of this in writing the past week. I confess that dinner was pretty good tonight in spite of the fact that I was working from pretty much bare cabinets. It’s 10:30 and If I hurry up I can still carve out a half hour or so to write tonight! This was on Book of Kells a while back and I'm just now getting around to answering it. If you haven't already answered these then consider yourself tagged if you're reading this. 1. What's the last thing you wrote? - A text message to my wife. 2. Is it any good? - I suppose for what it was intended. We aren't talking the Great Amerinan Novel. 3. What's the first thing you ever wrote that you still have? – I honestly can't don’t recall. 4. Favorite genre of writing? - Poetry. 5. How often do you get writer's block? - At least once every three or four months I get what I’d refer to as “writers funk” which starts like this: What I write would irk a bird if I lined his/her cage with it. Sometimes it lasts days or even weeks. In some instances (though rare) it will ultimately paralyze me and leave me in a writers block. 6. How do you fix it? – Usually two things. Hold my nose and keep writing to push my way through it. I also turn to reading several poets that I admire to remind myself that the printed word can be a powerful thing. 7. Do you save everything you write? – Any more, yes. I’d say that I capture about 98% of it, though it is not especially well organized unless it’s something I believe has promise. 8. How do you feel about revision? - It would be the only things that saves me 85 % of the time. It’s a necessity I not only accept but endorse. 9. What's your favorite thing that you've written? Oh my. Hard to say - I guess without dwelling on it probably "Sport Utality Poem" or "Night Wish". 10. What's everyone else's favorite thing that you've written? Probably "Tiananmen Mother" or "We Missed". 11. What writing projects are you working on right now? I have an on again off again manuscript that becons me at times. The working title is "File Folder" which is the name of what I would envision as that title poem. Something I wrote several years ago. Every few months I try changing the concept of it. It truly has more control of me then I of it. 12. What's one genre you have never written, and probably never will? - Horror. It's very likely I never will. I always enjoy being introduced to a new poet that is especially able to captivate my attention from the start. Not every poet is like that, but I often find that an excellent place to go looking for such inspiring wordsmiths is New Letters on the Air. I’ve had two recent discoveries from New Letters interviews. One is C. Dale Young who was interviewed by Robert Stewart and the other is Martha Serpas who was interviewed by Angela Elam. Today I want to talk a bit about Serpas because her interview especially hit home with me on several levels. Serpas grew up in the bayou country of Louisiana. Many of her poems poignantly cut to the heart of the crisis of survival of the very land that she considers her home. One of her books, The Dirty Side of the Storm was written prior to Katrina with the exception of one poem. But what I heard of the poems from the interview give a personality to the nature that makes up the complex Louisiana gulf basin. Serpas visits the erosion land in the basin with an eye on the threats to its very existence from a variety of man made encroachments including but not limited to the many canals that have been cut through the area for ease of access to the many oil operations. Of course, if these poems predate Katrina, they also predate the existing BP oil crisis. In her poem The Water, she has so many minglings of words that I just love. You hear them and they are have an almost living & breathing quality upon the page. One such example…. “like a dull brother-in-law in front of a TV. He means something to somebody— but not you, not just now.” The poem can be seen in its entirety here and even better can be heard as well. What I love about her poems is the way she seems to put man smack dab in the middle of nature with all the venerability the becomes both man and nature at the same time. The interdependence that cannot be denied. There too is a spirituality to her writing that is evident in seeking, finding, and losing. In closing this post I’m sharing a link to the LA Gulf Response that Martha Serpas recommends and check out the video trailer for a documentary that will be released later this year titled Veins In the Gulf. This would be one of my more organized mornings. You can actually see wood surface. I’ve decided to start my morning at work reading a poem before I start the day. I’m trying this because I’ve found that before my writing sessions doing this gets me relaxed and in a creative mindset and figure doing the same before beginning my regular job may well have similar benefits. I’ll let you know how I feel it is going in a few weeks. Following her father’s death, poet Emily Dickinson did something unthinkable in his lifetime: She began to romance her father’s best friend. Check out this article – I’m curious what people think about the revelation against the backdrop of conventional view of Dickinson? Today is the 36th Anniversary for Cathy and I. While 36 years can seem like a long time, it’s not long enough…. I confess that I wish I could tell Cathy that I won the Power Ball Lottery last night but alas I cannot. I buy tickets because she asks me to. I’ve never been crazy about state lotteries. I imagine that many people use what is otherwise non-expendable cash to chase a win / dream. I hear stories about people who win the lottery and their lives are ruined. Cathy works very hard… I know lots of people work hard but she works especially long hours and I confess I would love to say to her look, you don’t have to do this anymore. She tells me if we were to win, we would not be one of those couples who watch their lives crumble around them. I confess that I believe she is serious about this. I confess I made a run to the Evil Empire last night. I haven’t been to Wal-mart in a long time. I try not to take my business there. I was a Target earlier but realized we needed something much later at home after Target was closed. Amid the World Cup hoop-la I confess to being a scrooge. When I was about 13, I played soccer. My heart wasn’t in it. I wanted to play ice hockey and ultimately did get to for a time but I always found it hard to figure out why people would run around a soccer field for so long, expending so much energy to personally put the ball in play 3 to six times. The other thing is that there was so much talk about how Soccer was going to take the US by storm. By Storm!? Ok, that was 44 years ago. Hello! I confess I’m not really in as sour a mood as this post likely sounds like. Really, this is a happy day!!! I have the best wife who loves me in spite of my flaws. I confess I am so very fortunate. It’s always a thrill to hear from my kids (if I can still refer to them as such) so on a day in which I’ve been able to see two and talk with the other two, the day is a blessing. Still, there is a sadness that comes with two of them living in other cities. In the day of cell phones, text messages it does seem to shorten the distance a little. Actually, I’m pretty sure that the fact that I took so many photos on my phone seemed quite pathetic to everyone concerned so it was decided I needed a camera. I do enjoy taking photos. I think photography is a great tool for poets. Going out on a photo shoot can be a way of looking for ways to see your surroundings in different ways. Isn’t that what we so often do in poetry? Look for new ways to see things, that we might broaden our minds? One way I’m looking at things from a different view this father’s day is by thinking about my own father. While that may seem seem odd to most, it is outside the norm for me. My father and I had no contact during my formative years. It was not until I was around 19 that I recall seeing him. And in the few times we saw each other or corresponded after that it was generally an awkward association. Not something that I think either of us could be faulted for under the circumstances but sad none the less. He passed away in 2005 and I was unaware of it at the time. Our relationship or lack of one actually has profoundly impacted my life. In different times that impact looked quite differently to me. But I will come back to father’s day now for a moment because it has always been about me (at least since I’ve had children) and prior to that it was just a day. This sadly makes me wonder would it would have been like to have that kind of day where I would have focused on a father. To be the grateful son. It’s lunch time on Tuesday and I’m off to the confessional. Are you following me? During my years of active involvement in the Democratic Party I was exposed to an elected official who often said we must never lose the capacity to be indignant. I think it was likely a paraphrasing of someone else’s remarks but I thought about it then and again these past few days. At the time I first heard it, I believed it to a wise axiom, for when we become complacent with actions that are reprehensible we do ourselves a disservice. I do confess that I have become tired of the bitter and hateful discourse that has come to pollute our daily lives. And it would be easy to say that enough is enough! Lighten up a little. But this axiom has come back to me recently and I confess that in particular that I am incensed by the recent remarks by Rep. Don Young (R-Alaska) about the oil spilling (still) in the gulf. It seems Representative Young believes (and I quote) "This is not an environmental disaster, and I will say that again and again because it is a natural phenomenon." Perhaps Rep. Young believes this but drilling a deep sea well from a platform in the Gulf and suddenly after an explosion, the gushing of some 39 million gallons of crude oil into the Gulf (and counting) has nothing natural about it. It is not a part of nature. I confess that I'm also incensed by a political ad run by Rick Barber, a candidate for Congress in Alabama’s second district. The ad is a representation of Barber ranting on the Internal Revenue Service, Health Care, etc., and shows an angry Barber pounding his point all the while a pistol lay beside him as he preaches to our founding fathers. In the end, we hear the rather threatening phrase "Gather your armies." Barber’s ad is incites insurrection. He too may be indignant. But I confess that even indignation must be tempered with responsibility. At a time when many openly carry firearms strapped to their side in plain sight, even as drinking their coffee at Starbucks, there is a responsibility that comes with our political system that asks of each of us the civility that makes peaceful political change a desirable end of our democracy. I confess that I did not intend to sound preachy today, but I stand by everything I’ve said. I love this quote from Merwin… it’s sort of how I see poetry. A poem can be the link between another place or time. It’s a stone. 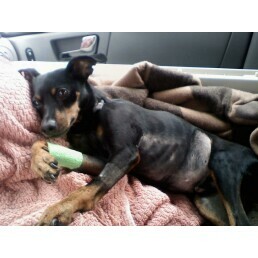 K-man (one of the many names Klaus has picked up over the years) is doing better in his recovery process. In case you missed it, Klaus sustained serious injuries about three weeks ago. We were fearful that he had a spinal cord injury because he suffered paralysis in his legs. He had feeling in them but for the most part was unable to control any movement in them. He is using them now, the front more then the back. He struggles to upright himself and has some range of motion as we do physical therapy with him. He has his sassy attitude back. He gets lots of attention because he still requires much help. It’s so good to see his determination and yes at times his frustration because that tells me that he is pushing his limits. One day he’s going to be able to stand again all on his own. Soon the cats food dish will not be safe. I feel like we’ve already had more rain this year than all of last. I wake up mornings and I wring out my water logged brain and reinsert it in my head cavity and start the round all over. It has become insane! At the left is a shot of the evening sky – the view westward from our neighboring Target. Yes it appears to be clearing. Long term however, we have showers in the forecast again tomorrow and Tuesday. Who knows beyond that. It’s just like Chinese water torture only on a larger scale. Some writing success during the past week. Some things I’m happy with as draft starts. Sometimes it's not easy pulling together a confession a week. Not because I don't have anything to confess but because the things I have to confess these days are not the stuff tabloids are made of. So if you care to, come along with me to the confessional. I confess that after about a month, I love my Blackberry Tour. It was hard moving from a palm platform because I liked the platform. I also liked having a touch screen and I confess that up until about 10 days ago I would still try touching my screen which makes me feel a little goofy but I think I'm finally over that. I like that it loads the Internet with greater speed than my previous phone. I like the assortment of applications available to me. Sprint Navigation is awesome! I confess there are some aspects of electronic things today that I am becoming more ambivalent about. I have been able to weed out a lot of my email with my phone before I ever get home to my laptop and I like that. But last Sunday I had a work related email that came in and I wanted to respond to it and at the same time I didn't. As a result I decided I'm not sure that I like getting my office email available to me 24/7. I confess that in our family, I'm the text messaging weakling. Each of my family member probably way out text me. Two I know for a fact because I see their message counts on the bill. I don't even come close. There have been multiple days that I have come home an not turned on my laptop during the past two months. That would have been unheard of not long ago. I think three days in a row is my longest abstinence. I confess that my blogging posts are down. I also confess that I am less enamored by Facebook these days. It is mostly the privacy thing. I think their policy changes have been disingenuous and this really irks me. But there are other things as well. Still, I do appreciate the contact if even limited from many other artists and poets. So I'm not quite ready to pull the plug yet. I think it is the Capricorn in me that likes electronic trinkets and phone applications. But I am somewhat restrained compared to some people I know. As for my Blackberry, I can justify it by the functionality of its many features. The calender, camera, task lists besides phone itself are just a few of those things that provide value to me. As we become more electronically conditioned as a society, I'm trying to pick and choose for what it's worth. It seems the train has pulled out... where are we going? For several weeks now I have been thinking about the future of the printed word as we know it. As the weeks have gone by I have collected in my mind a spider web of sorts of related thoughts that have attached themselves or become caught-up in in my flow of thought. Some of these thoughts have been fueled by things I've heard on NPR or read elsewhere but they all seem to collide with the issue of where the electronic age we are in is taking publication of creative material. It stared with feeling that perhaps this latest wave of ebook apparatus has perhaps been gaining traction. I've watched with interest the pricing of electronic books themselves seem to hover for the most part at the $10 mark. Given materials for electronic books are (paper, ink binding) are non-existent, this leaves a larger profit margin to work with up front. So a traditional publisher who has the electronic rights has nearly no production costs. You put together the artwork and set up the file and zing! Oh, right, it still has to be marketed. They won't be seen on traditional bookshelves in stores unless they have a companion print edition. 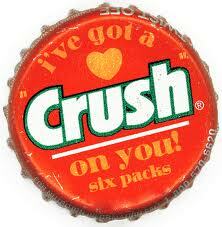 They will need to be marketed (thought pause) electronically! It seems that there really is little expenditure needed in this process, so my question is, "will this be a better deal financially for the writers or the publishers/distributors?" The ultimate cost that these books settle into like anything else will adjust themselves based upon the market demand.If ebooks become the norm of future publishing this really could change the scope of the economics associated with earning a living as a writer. It could vastly improve it, but I tend to think that will not be universal. Certainly those who've made a name for themselves could adequately market their product without a distributor and many others will have to accept what margins publishers offer or battle for attention amid what is clearly going to be an abundance material as anyone will be able to publish. Yet where this is leading economically, epubishing that is, is not the only aspect of this that is on my mind. A recent NPR piece called to question what impact the Internet and utilizing electronic devices is having on our reading abilities. The Shallows': This is your brain Online offers some interesting questions about our reading habits and comprehension. Are we so accustomed to the Internet with pop ups and scrolling, throw in e-mail and searches; that we are dumbing up our reading skills and comprehension. Because we can say something in 140 words or less doesn't mean it is the best way to communicate ideas. I have a lot of questions and concerns about the future of print in our society. Answers I'm lacking. Back home, as I do his blog post, Klaus is near by - his recovery is coming along though slowly. We put on a CD of classical music (through a Dog's Ear ) which he seems to be enjoying and and is kinda of funny because no one else in the household (people wise) likes the music except me. I'm not certain what that says about them or me but we'll leave it at that. Some work to do now- but I do have writing on my radar for today as well. I saw this AP photo on Suzanne Frischkorn's blog and was struck by the simplicity of the message about what has become quite likely the greatest ecological disaster in our history. 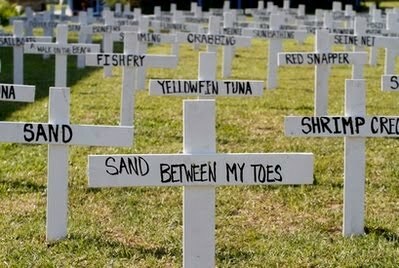 Sadly there is nothing simple about stopping the gulf spill. It continues to spew oil into the gulf creating a growing ecological dead zone. If the spill were stopped today (which won't happen) the damage to the coastal areas are already beyond the imaginable. No one knows when this will end and this is precisely because we have no fail safe remedy. The oil industry is unable to manage their own disaster. Government agencies charged with regulating the industry for decades have been beholden to the industry. This should come as no surprise. And all this time, there are people in this country who have argued in favor of more aggressive offshore drilling. Not only stated their case for it, but held rallies carrying signs and chanting, "drill baby drill." What do these people have to say now? Perhaps they can put into words their justification in such a way that people along the coast that make their living off the region can understand. This is not going to be like a bad growing season to a farmer. This is not a year of drought. This is destruction. This is uncharted waters and indeterminable death to an ecosystem. Sometimes man sees himself separate from the ecosystem and thinks he is without repercussions. I'm not sure which is the greater ill, short sightedness or greed. They both seem to be are Achilles heel. It’s Tuesday though it really doesn’t feel like it to me so before it turns Wednesday already, let go the Confessional. I confess that for the first time in I don’t know, like almost forever I did not watch the Indy 500 this weekend. I love the Indy 500. I don’t care for NASCAR racing but I love the open wheel Indy cars. So how did this happen? I was pretty much overcome by an incident this weekend. I didn’t intentionally not watch it, it just completely fell off my radar till after it was over. What was a horrific injury to one of our dogs that left him injured and unable to move his legs left a cloud over the entire household. He spent the weekend and right up till this morning in an animal hospital. The fear and I would add assumption was that he suffered a spinal cord injury. Diagnostics and treatment of such would be enormously costly and with guarded prognosis. This morning he came off the intense steroid treatment and pain killer IV and was transferred to a neurologist. I confess that this weekend I pretty much lived on prayers that somehow there was a bit of hope for Klaus. Around 10:30 this morning the news came that the neurologist felt he did not have a spinal cord injury but that he would make a recovery. Even two ribs that the animal hospital believed were broken did not appear to him to be broken. He has sent Klaus home to us with instructions for him to be allowed to move as much as he wants and if after two weeks he is not up and walking – he will talk with us about physical therapy. I confess that I do believe in miracles.